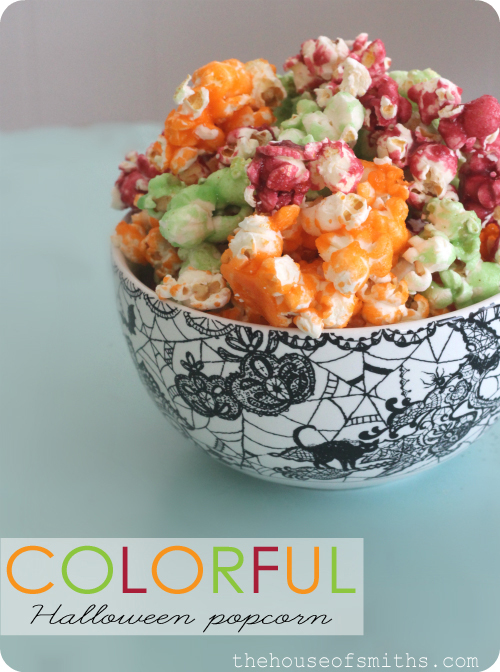 Colorful Jell-O Popcorn Tutorial - Our Best Bites New Cookbook! Alright, I can't wait any longer. Who's ready for fall? Do I love Summer for the freedom, sunshine and pool time... yes. But to be honest, I HATE the heat! I know I'm probably part of the minority here, but I LOVE the fall and winter. The chill in the air, snow, cute jackets, layering colors... really, I think it boils down to the fact that you can always pile on clothes to get warmer, but you can only get so naked, before you (and others) start feeling uncomfortable. That being said, I'm excited to share my first Halloween themed post! I have another 2 or so in the works, but I thought I'd start off with this easy, yummy one, to kick things off. Thanks to my cute friends and fellow bloggers, Sara and Kate from Our Best Bites, this recipe was inexpensive, simple and totally delicious! 1. Preheat oven to 300 degrees F. Line a jelly roll pan with foil or parchment. If using foil, spray lightly with nonstick cooking spray and set aside. 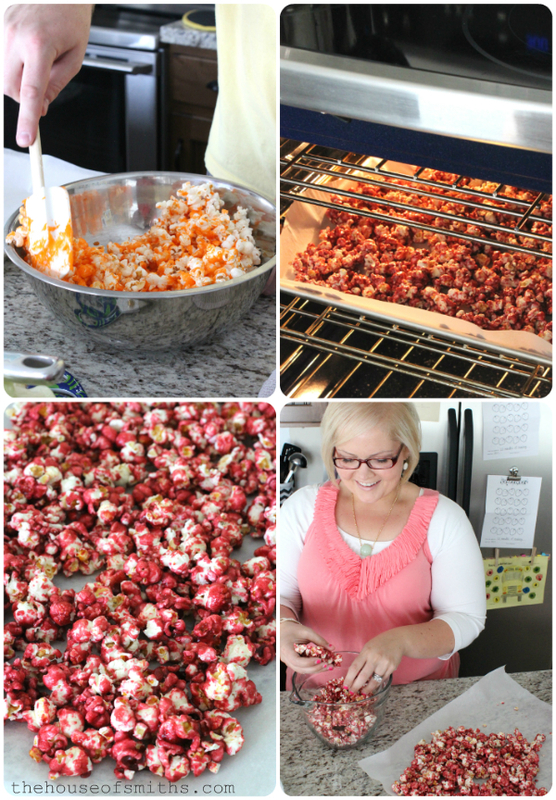 Place popcorn in an extra-large mixing bowl. 2. Combine butter and syrup in a saucepan over medium heat. Stir until butter is melted. Add sugar and gelatin and stir to combine. 3. Increase heat and bring to a boil. Reduce heat and simmer 5 minutes. 4. After the sugar mixture has simmered immediately (and carefully) pour over the popcorn in the bowl. Mix immediately and continue stirring until the popcorn is well coated. Spread the mixture evenly onto the prepared pan. 5. Place the pan in the oven and bake for about 10 minutes. 6. remove the pan from the oven and allow it to cool to room temperature. 7. Break the popcorn into pieces and enjoy! Seriously, this stuff is da-boooomb! It's sweet, tangy, crunchy... just, yum! 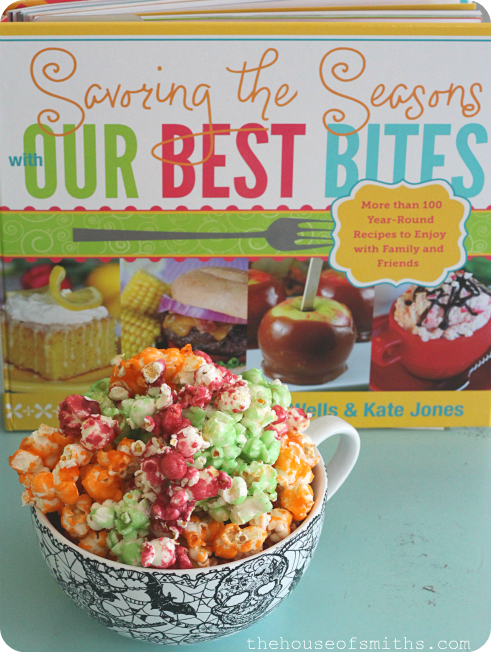 We were lucky enough to snag a copy of this awesome new Savoring the Seasons cookbook early, so that we could review and try out a few of the recipes, and DANG there are some freakin' good ideas in here! No joke, we've been planning our grocery list around this book for almost 2 weeks now, and have YET to be disappointed in anything we've tried. 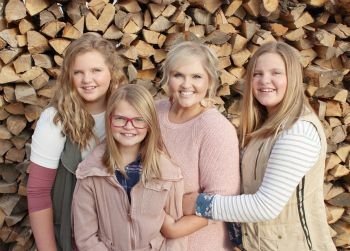 Everyone knows by now that I'm on this crazy weight-loss journey, so what I eat (and what I don't) is really important. Even though there are a few occasional bites of Jell-O covered popcorn (hee, hee), 99% of my food is protein packed and veggie-full! There are TONS of recipes in this book for low-cal, healthy eating ideas and that's why I love it so much. Some of them you just have to put your own spin on. For example, in the new Our Best Bites book, there is a recipe for Peach-Kissed Turkey Burgers. Instead of a bun, we cut back on the carbs and used Boston lettuce to wrap up our delicious sandwichs, along with greek yogurt and a little peach jam for the sauce, instead of using mayo...also, instead of using potatoes for a side, we made the baked zucchini, also from the new book! 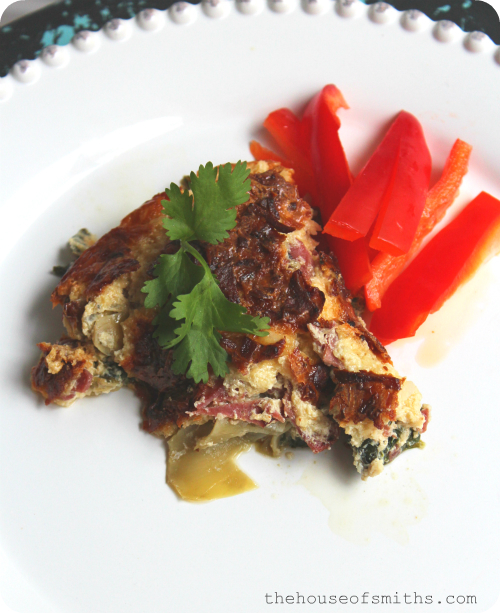 The same goes for breakfast, with the Artichoke quiche from the new book (yum!). We substituted regular bacon for turkey bacon, skipped the crust, used fat free half and half instead of full-fat cream and cut back just a bit on the cheese. Ta-da! protein packed, low-cal goodness with tons of flavor. I seriously can't recommend this book enough. If you were obsessed with the first Our Best Bites cookbook, like I was, then you're going to love this one even more. 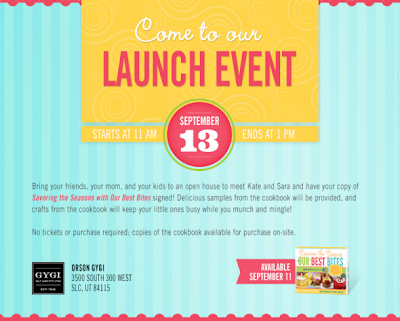 In fact I'm heading to the launch party for the new book on Thursday so I can finally meet the amazing Sara and Kate duo in person... and you better BELIEVE I'm getting my copy signed! You can snag yourself a copy of the new Savoring the Seasons cookbook at any Walmart, most Costco's, Amazon or Barns and Noble. Thanks Sara and Kate for all of your hard work! There is seriously nothing better than seeing fellow friends and bloggers hit big-time success. It gives me goosebumps!!! 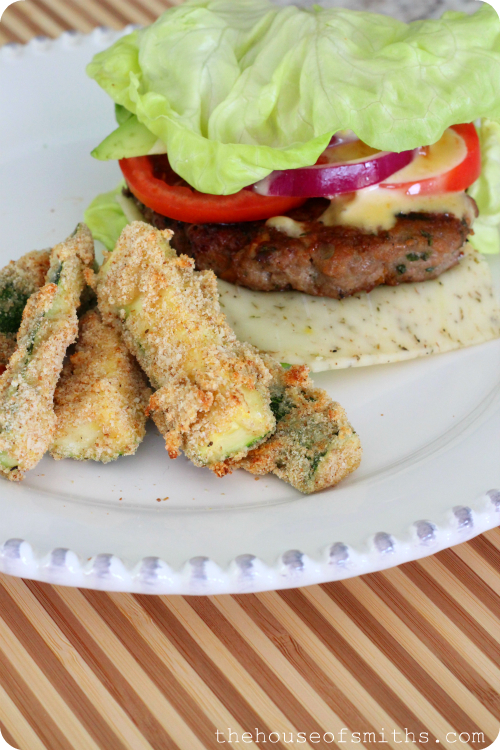 That baked zucchini and burger looks amazing. I might just have to replicate that somehow (I live in Australia). Can't wait to try it as well. I bet my children will love this when I cook this for them. A healthy living comes to a healthy lifestyle. I love jello popcorn!! I make it a little different, instead of corn syrup and sugar I use marshmallows. 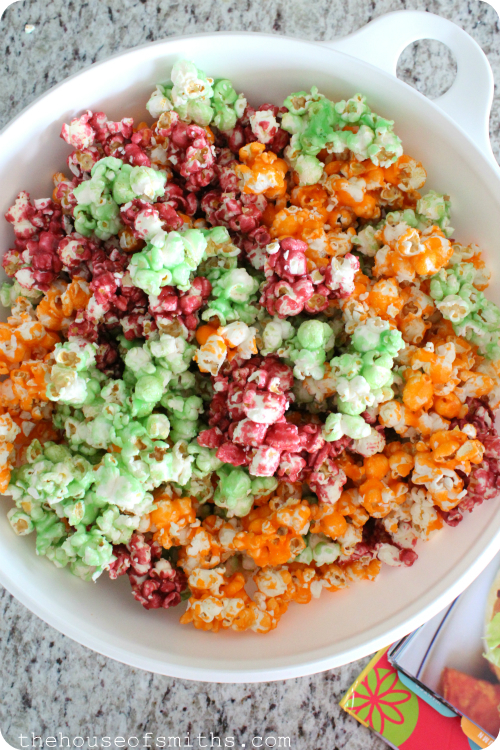 Melt the butter & marshmallows, add the jello and pour over popped popcorn. I also shape mine into popcorn balls and they make great treats to give. Yours looks super yummy!! Happy fall!! OH wow! That sounds amazing! 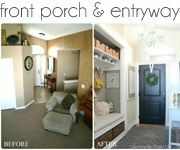 Pinned and I can't wait to give it a try. Also, last week I made lettuce wrap fajitas using green leaf lettuce. It seems like it would be pretty popular but I haven't heard or seen any other recipes before I made mine. It was FANTASTIC!! I'm planning on doing a recipe post about it. OH and your amazing salmon tacos would be DELISH wrapped in lettuce! I love their first cookbook! So many fantastic recipes! Can't wait to get my hands on the second! I think I'm going to have to try that popcorn when it's my turn to send in a snack at my son's school! awwww!! I cant wait to get mine!! I told my husband that I wanted to cook my way thru their first book and I basically did...so I need a new book! Ha! making the popcorn.Way to go.Love grandma C.
It's awesome your adjusting recipes for your diet, good job! You said geek yogurt LOL! I like this book because the recipe looks delicious but easy to prepare and very affordable. Popcorn is everybody's favorite and I want to try this new flavor and I'm sure my family would love it too. Where did you get that bowl?? Did you make it?? Buy it?? Where did you get that bowl?? It is adorable! That popcorn is so pretty and looks delish. I'm a sucker for popcorn myself and will absolutely HAVE to try this. My mouth is watering! This is one of my grandma's oldest recipe and I love strawberry, lime and orange flavors. YUM! That popcorn just became the fun snack for my son's rockstar birthday party. And, that cookbook looks pretty fabulous. What great ideas, Shelley. Thank you! 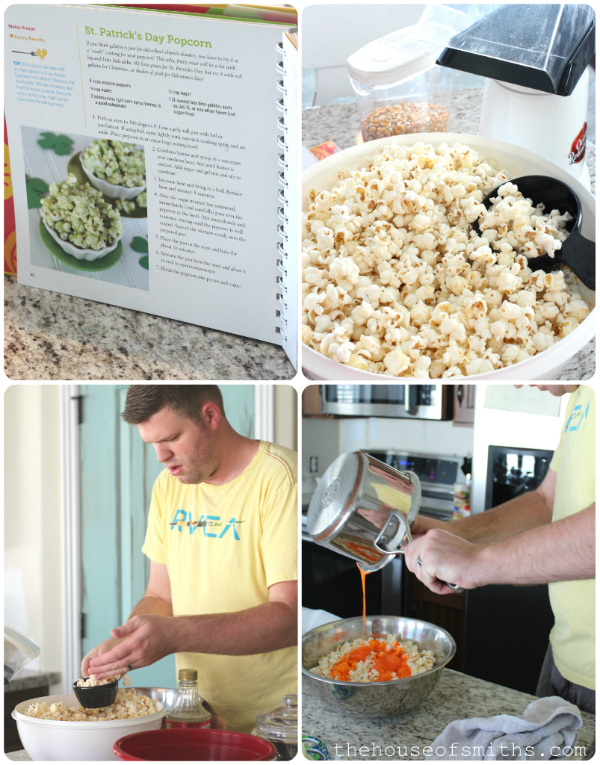 I made the jello popcorn at home and it was great! This looks so fun and delicious! There's something about fall that makes me think of popcorn... thanks for sharing... I'm definitely going to try this. I know my two girls will love it! I can not wait to try the popcorn. I too am soooooo very ready for fall and winter, sweatshirts,& snow are my favorite! 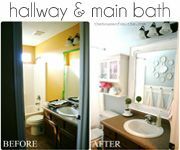 Thanks for sharing I love your blog it is so awesome! I so can't wait to make this popcorn. I too am a lover of fall and winter, sweatshirts and snow are my favorite. 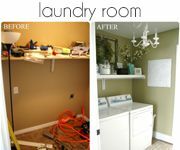 This is the first time I have seen your blog and have fallen in love with it. Made some this morning with raspberry Jello and honey from my dad's bees... Oh. My. Goodness. Yum! I have a few events this fall that I need to bring a snack to. 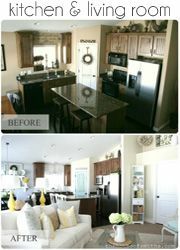 This will be it!